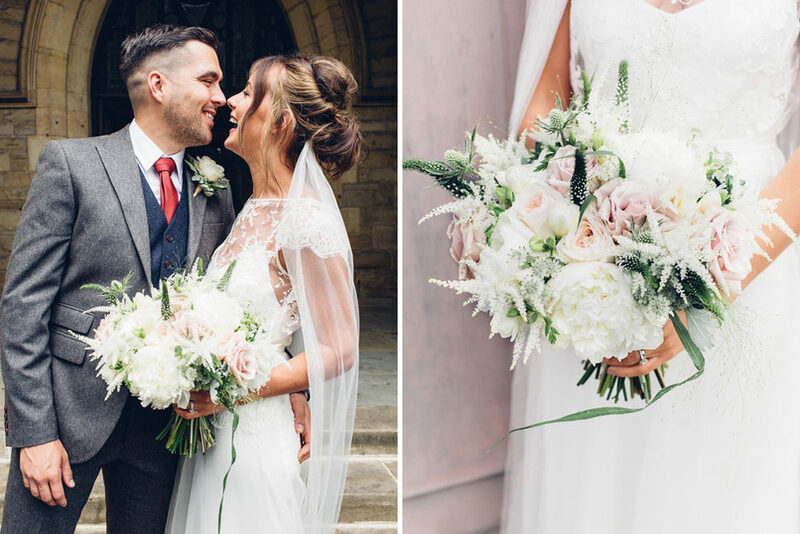 I always have a soft spot for a Sheffield wedding as it’s my university city and where I lived with my boyfriend for the first time, so I’ve loved putting together Jaye and Tom’s big day. 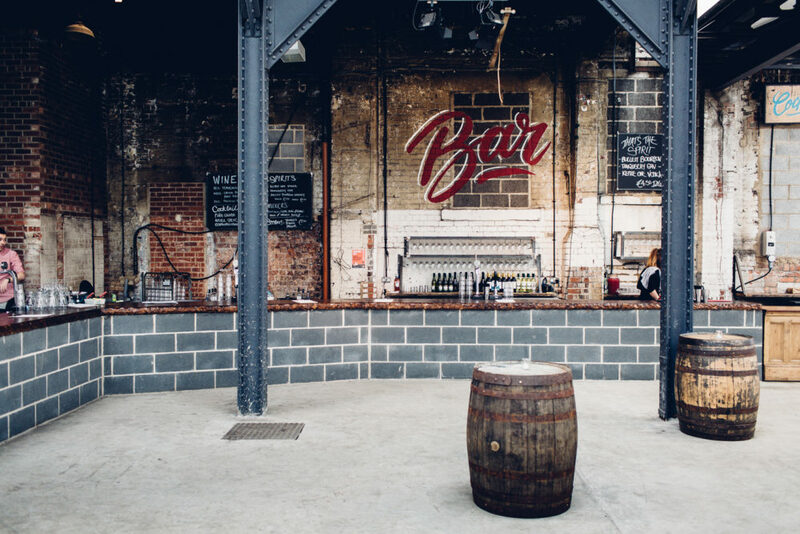 I can totally vouch for Tamper Coffee too, in fact, I’m tempted to jump in the car and head back up North to visit the warehouse space they’ve just taken over in addition to their coffee shops, Jaye and Tom’s wedding reception just looks so cool, the styling is spot on. 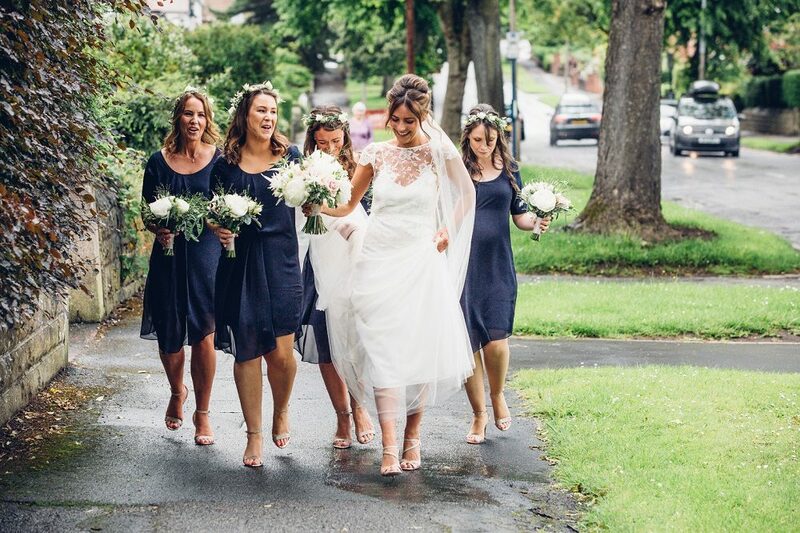 Funnily enough I’m also a huge fan of Kate Halfpenny’s designs, and Jaye looks simply beautiful in her Halfpenny London gown. Kate’s gowns are always an absolute feast for the eyes and this one is no exception. The pretty lace crop top over the silky slip dress has got my heart all of a flutter – Kate knows how to design dresses that fit beautifully. 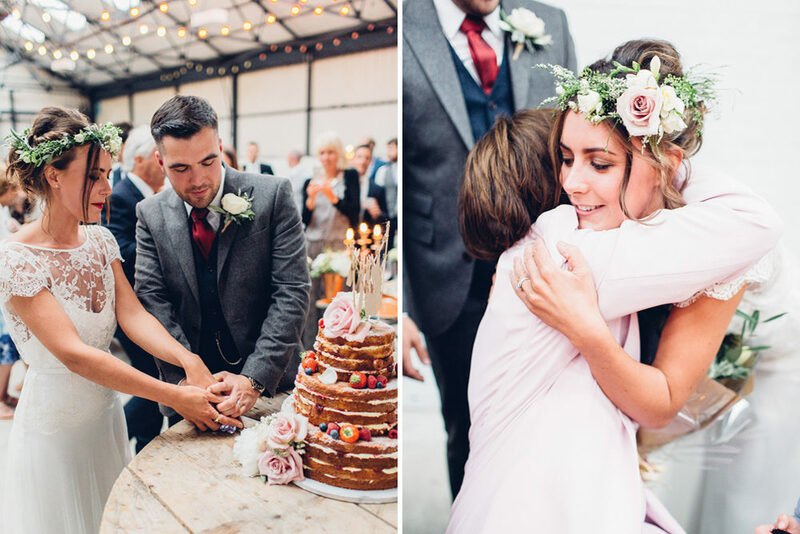 Jaye the Bride: Thomas and I met a little over 7 years ago, and as soppy as it sounds I knew we would be together forever. We just clicked. We are both very creative people, so when Thomas finally popped the question (after 5 years of waiting might I add) with an engagement ring that he had designed himself I knew we would take a very hands on/DIY approach to our wedding preparations. 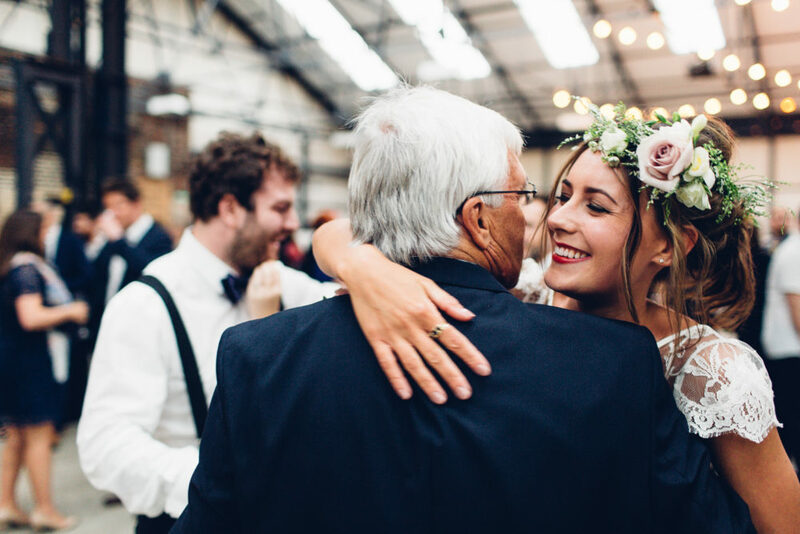 Initially we didn’t really have much of a vision of what we wanted for our wedding reception but I knew from day dot that I wanted to get married in St John’s Ranmoor Church. Having gone to school in Sheffield I spent every school carol concert and harvest festival in that church and fell in love with its grandeur and beauty. Also as it turned out the Vicar that married my two older sisters had recently moved to the same church so it was meant to be. In regards to the venue the only thing we were certain of was that we wanted something that was relaxed and something we could make individual and unique to us as a couple. We went and looked at a number of hotels and outdoor venues but nothing really gave us the freedom we wanted to get creative. We really love the vibe at a local coffee shop in Sheffield, Tamper, and after talking to the guys there discovered they were in the process of taking on a big warehouse space, 92 Burton Road. When we first viewed the warehouse it was an empty shell, no building work had been done and it was a mess. But we both instantly fell in love with it. From the bare brick walls to the exposed steel beams I was just able to picture us there with our family and friends having one big party. The team at 92 Burton Road were great and I really loved their vision for the place and I felt confident that this would be a space that we could truly put our own stamp on. The next step for me was the dress, I had only been to one shop prior to visiting The White Room and I had an idea in mind of the style of dress I was looking for, basically anything with a low back and relaxed feel. 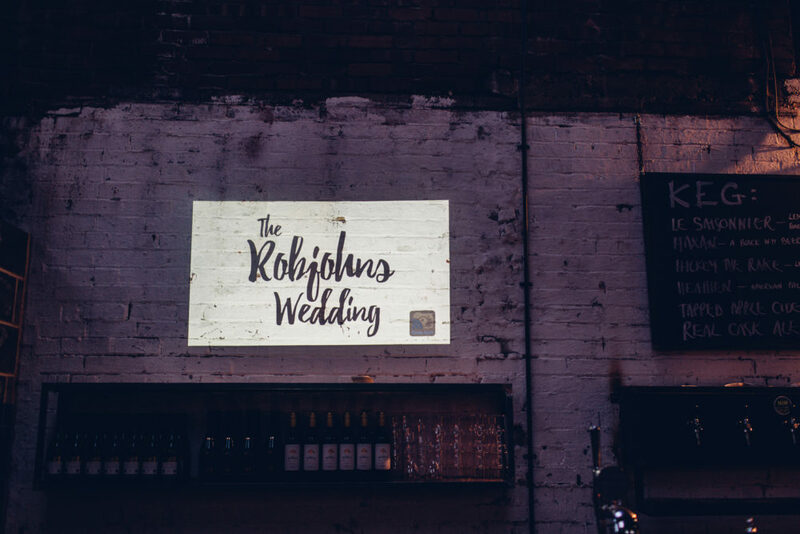 With the venue confirmed I wanted a dress that would be fitting for both locations and that would tie the two very different venues together – queue Kate Halfpenny and The White Room team. As soon as I slipped the Halfpenny Iris dress over my head, I knew it was the one. With the intricate and delicate French lace, the most beautiful and comfortable slip and cute belt to synch in the waist I was sold. It was really important for me to be comfortable on the day, I wanted to be able to eat a good meal and throw some serious shapes on the dance floor. 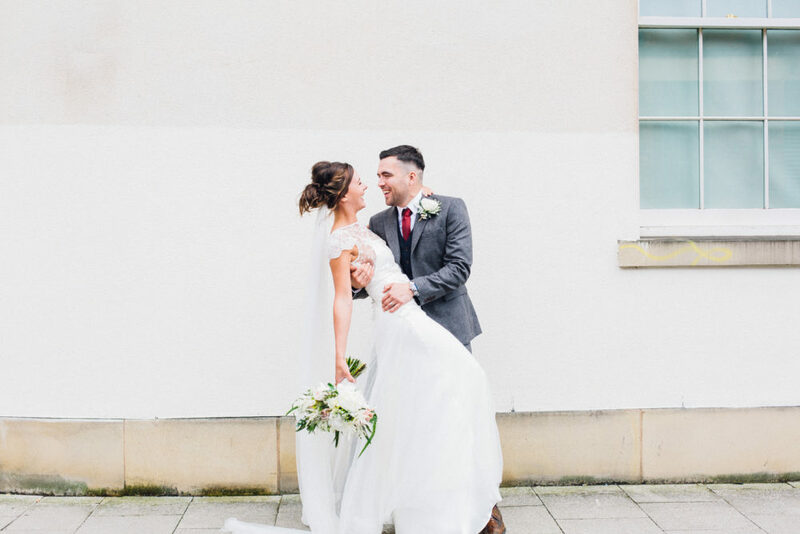 The Halfpenny dress was the perfect mix of vintage elegance with a hint of princess…It felt simple yet eye catching and I felt beautiful. I added a long one layer silk tulle veil for the church and a flower halo for the evening and these two items transformed the dress perfectly for the two different environments. I kept jewellery to a minimum but a key piece for me was the sapphire ring. I have two sisters and when my Grandmother passed away she left each of us a ring; a diamond, a sapphire and a ruby. My middle sister, Gemma, lent me her sapphire ring for the day and this became my something old, borrowed, and blue and it went with the vintage feel of the dress perfectly. I also felt like my Grandmother was part of this special day. There was no real colour scheme for the day. The bridesmaids were in navy French Connection dresses, more because we liked the style of the dress! My main priority was that the girls would be happy and feel comfortable on the day. I also wanted to get them a dress they could wear again and I feel like we achieved this. My sister Gemma had to have her dress altered slightly so that the ruching sat above her growing baby bump, and the finished result looked great. The grooms and the groomsmen suits were from Next. Thomas decided to mix and match the colour of his waistcoat (navy) and suit (stone) and added a red tie. This sounds like a horrible combination on paper but it just worked. The rest of the groomsmen were all in plain navy suits with the same red tie as Tom. As a wedding gift I gave Tom a watch which he wore on the day. We asked Tom’s brother Damon and one of my best friends to do a reading. Damon did a very emotional reading entitled ‘The Way of Love’ from 1 Corinthians 13 and Lauren did a reading entitled ‘How Falling in Love is like Owning a Dog’ by Taylor Mali. Not only was the reading very fitting for Thomas and myself as we are massive dog lovers and owners of a grumpy long haired Chihuahua and extremely boisterous Pug, but it also really helped to relieve some of the nerves that Tom and I had during the church service and got a few laughs in the process. It was just so completely unexpected for a church reading but shows how well Lauren knows both Tom and I. The flowers at the wedding were honestly the highlight of the entire day. I shall never be able to thank our wonderful friend and florist, Catherine (Petalis) enough. She went above and beyond and it was such a wonderful experience working with her. She instantly got my vision from our first meeting and from that point on I really just gave her free reign. I had total trust and confidence in her and her skills and the flowers were everything I could have asked for and so much more. From the beautiful free form bouquets, to the elegant flower halos, the mish-mash of stuffed jars and pots that formed out centre pieces to our amazingly decorated ‘selfie’ wall and our breath-taking hanging masterpiece that was suspended above the top table – it was truly show stopping. 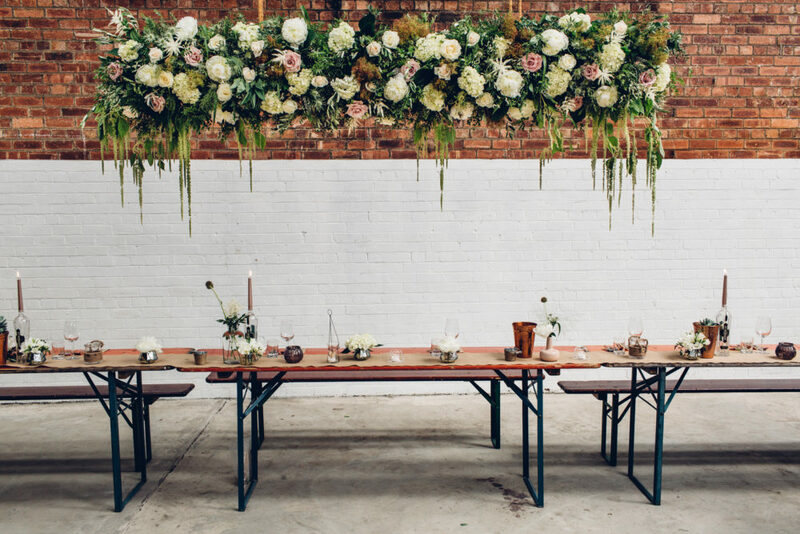 As soon as we had decided on the warehouse venue I knew I wanted minimal decorations, I just wanted hundreds of flowers. The image in my mind of the delicate fresh flowers against the rough exposed brink was absolute perfection, but the results were better than I ever could have imagined. Thomas designed all of our wedding stationary and was really the visionary for so much of the day; I probably haven’t given him enough credit for this! From the invites to the order of service to our table plan, everything was designed and created by him. 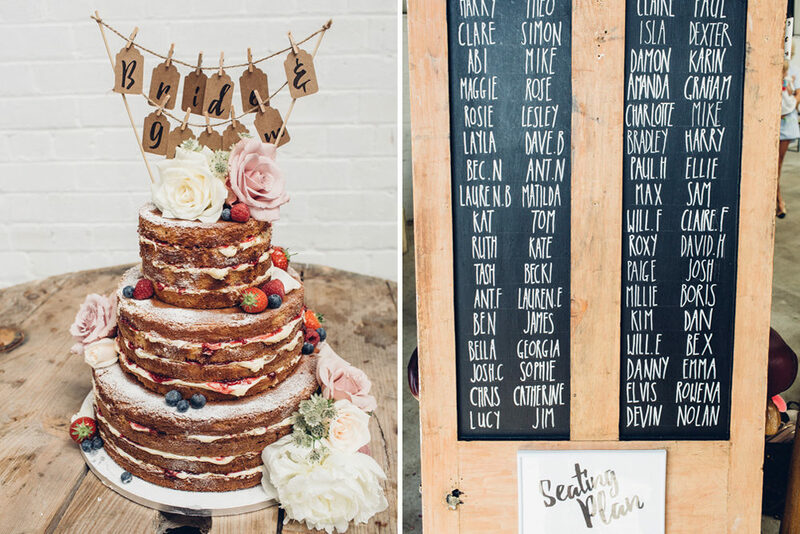 Our table plan was actually a reclaimed wooden door and he painted two of the panels in chalk paint and then wrote the seating plan on it. It was so simple but really effective just leant up against a wall as you walked in. Our wedding favours were edible flowers that were I encased in beautiful lollies. Sarah from Eat My Flowers owns an edible flower farm in North Wales and she and her EMF team grow and create all of their own products. Not only were the lollies gorgeous and tasted delicious I’m a massive fan of supporting independents and I couldn’t have been happier with the finished results. We also used them as our place settings, we just tied luggage tags with the guests names on they were really effective. The food at the wedding was more of Tom’s area of expertise than mine. But we wanted it to be a very social affair. There were huge bowls of salad and plates of bread that guests could help themselves to and we had a choice of hake, lamb or roasted pepper for the main meals. For dessert it was good old fashioned brownie and ice cream and as I’m gluten intolerant The Depot Bakery made all of the brownies gluten free, not that anyone noticed – they were delicious. The main drink of choice was Prosecco, my friends and I have been known to get through a fair few bottles on a night out so we made sure we were well stocked. We also had 3 cocktails available: Aperol Spritz, Pina Colada and my personal favourite, the Cosmopolitan. We had our friend Felicity DJing in the evening and there was a massive party feel, Thomas and I both thoroughly enjoyed dancing the night away. After discovering naked cakes on Pinterest I knew that’s what I wanted to reflect the naked feel of the warehouse and Sarah and Josh from SJ Cake Studio did not disappoint. We only exchanged a couple of emails and the cake looked perfect. We went for raspberry and white chocolate, decorated with seasonal berries and a few sprigs of flowers from our florist. We sat it on a massive old wooden rope bobbin and it looked and tasted gorgeous. Our videographer is one of Tom’s friends and we asked him to film the wedding very last minute. We wanted all the most memorable moments capturing on film and I’m so happy we decided to ask him, looking back at the footage now stirs all the emotions from the day and I couldn’t image not have those beautiful memories captured on film. Our photographer, Devin Ainsle, was brilliant! Another friend, it was great to have him involved in our special day. Devin is such a chilled laid back guy, I was so comfortable having him around from getting ready in the morning to getting down on the dancefloor and he did a wonderful job. 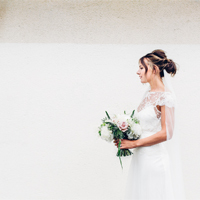 The style of photos he takes I feel really complemented the minimal/rustic feel of the wedding and the images he has produced are simply stunning. If I could give any future brides any pearls of wisdom I would say, enjoy every single second because the whole day goes by in the blink of an eye. Don’t stress over things you can’t control, the rain on our wedding day allowed us to get some hysterical and totally unexpected pictures and finally don’t just enjoy the day, enjoy the whole process it’s one journey you’ll want to relive over and over, so don’t take any of it for granted.